Everyone loves to travelbut how can bands be sure that their students are still learning while sightseeing and touring around the world? Here are some tips for musical growth during travel. From Hawaii to New York, from D.C. to Disneyland, marching bands love to travel. Trips and tours give students the chance to perform in renowned venues and big-name events, bond with their fellow musicians and visit new places. With all that excitement, sometimes people can forget the reason they're traveling in the first placeto become better musicians! Band director John Rants from Marysville (Wash.) Pilchuck High School shared some of his ideas for ensuring musical growth. To make sure that students have a balance between sightseeing and learning, make sure that plenty of opportunities exist for both. Communicate with the band, so that students and staff know in advance what to expect. Musical opportunities should be paired with fun events. 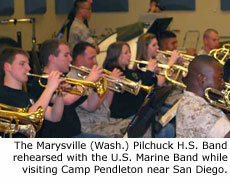 When Rants took his band to Southern California, they visited Camp Pendleton near San Diego. The group ate in the Marine Corps' mess hall and rehearsed with the Marine Band, then visited the Medieval Times dinner theatre. Later in the trip, the band visited Disneyland, performing and participating in Disney Performing Arts clinics paired with free time in the theme park. "When I plan a trip, I discuss with the parents, students and administration that I have three criteria," says Rants who was named the 2010 Seattle Symphony Music Educator of the Year. "It must be educationally sound, musically sound, and it's equally important that the kids have fun. With that attitude, the kids know that all three factors are involved." When a big trip is on the horizon, musical selection over the whole season can cater to the future performances. If you know that a certain song needs to be played on the trip, the band can "double-dip" and incorporate it into that year's regular-season repertoire. To prepare for clinics and recording sessions, bands can practice sight-reading and dress rehearsal etiquette all year long. Rants hosted movie nights in the band room, complete with hot dogs and popcorn, to provide context for upcoming trips. To prepare for a trip to Hawaii, he showed the film "Pearl Harbor," so that when students performed at that location, they would understand the history behind it and feel a great emotional impact. To prepare for the Disney Performing Arts Soundtrack Recording Session, he showed film scores by John Williams and discussed the impact and production of soundtracks. "We'll start talking about soundtracks and what to expect when they walk into a studio," Rants says. "They start to listen in a different direction than they would before." When it's time to perform, the band may need a quick pep talk or reminder that this is what they came to do. But according to Rants, it doesn't take much. "It's not real hard to get them motivated about performance," Rants says. "They all of a sudden realize they are performing in a venue that is unlike anything they've ever done, so they step up to the occasion." Back at home, the lessons learned on the road can be referred to and reinforced. Use a few classes to review and constructively critique the performances. Rants and his band viewed the DVD of their recording session provided by Disney and discussed what they felt they did well and what they could have done better. They also used a secure online message board to discuss the trip. Rants posted leading questions, and the students took over the conversation from there. One of the greatest benefits of performing in new venues is experiencing new audiences and different reactions. When traveling, the crowd consists of more than community members, friends and family. "Around here we have a certain reputation," Rants says. "When we go to a new place, people are not aware of us until after we performaudiences behave differently." While time spent sightseeing and bonding with friends create memories that students will never forget, the musical lessons learned will help to improve the band and make the students into better musicianswhether they realize it or not. Photo courtesy of Marysville Pilchuck H.S. Band. Logo courtesy of Disney Performing Arts.